A well-written, inviting textbook designed for a one-semester, junior-level course in elementary number theory. The intended audience will have had exposure to proof writing, but not necessarily to abstract algebra. 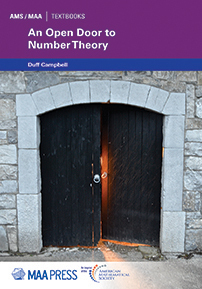 That audience will be well prepared by this text for a second-semester course focusing on algebraic number theory. The approach throughout is geometric and intuitive; there are over 400 carefully designed exercises, which include a balance of calculations, conjectures, and proofs. There are also nine substantial student projects on topics not usually covered in a first-semester course, including Bernoulli numbers and polynomials, geometric approaches to number theory, the \(p\)-adic numbers, quadratic extensions of the integers, and arithmetic generating functions. An instructor's manual for this title is available electronically to those instructors who have already adopted the textbook for classroom use. Please send email to textbooks@ams.org for more information. [The book] weaves a path through various interesting topics and shows how they are connected and can be extended.